This department strives to provide the most competitive pricing and expedient development by packaging all aspects of construction under one contract. The site development Department of TDS has been developed to offer our clients the most diverse line of services within our industry. From the smallest commercial site to the largest turnkey residential development projects, TDS has the skills, equipment, and experience necessary to complete any development contract which it accepts, in the region. 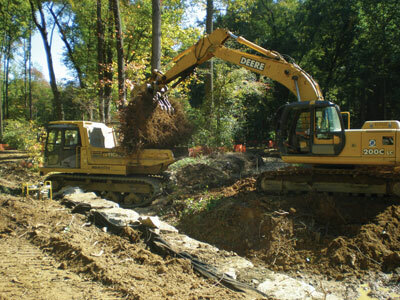 In addition to our in-house capabilities, we work closely with several consultants and subcontractors specializing in fields such as poured-in place concrete structures, rock trenching, soil manipulation and stabilization, landscape and irrigation construction, wetlands mitigations, stream restoration, planting and site lighting, to further improve our ability to meet our customers needs in challenging situation.